Lung cancer. 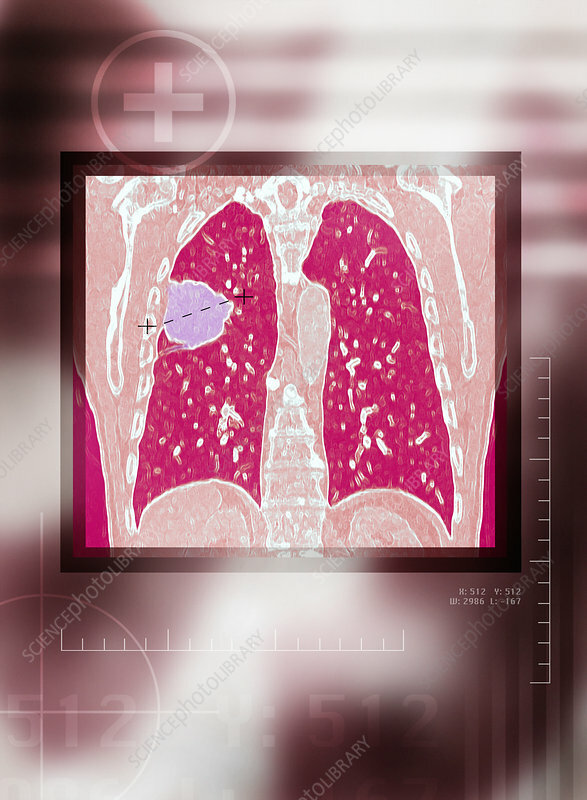 Coloured computed tomography (CT) scan of a patient with lung cancer. A malignant (cancerous) tumour (purple) is seen in the right lung (red). There are two main types of lung cancer, small cell lung cancer, and the more common non-small cell lung cancer. The most common type of non-small cell lung cancer is squamous cell carcinoma, which develops from the cells that line the airways. The majority of lung cancers are caused by smoking cigarettes. Lung cancer can also be secondary, or metastatic, meaning it has spread from a site of primary cancer. Treatment is with removal of the tumour, where possible, often combined with radiation and chemotherapy.